In the spirit of "Back to School", I've pulled together some fun inspiration that brings me back to the good ol' days of jumping rope, standard lined paper and pencil boxes. Do you remember how you felt at the beginning of each new school year? For me it was a combination of excitement and anxiety mixed in with the promise of new beginnings. Not to mention the joyful anticipation of wearing a brand spanking new pair of shoes... Exciting times! 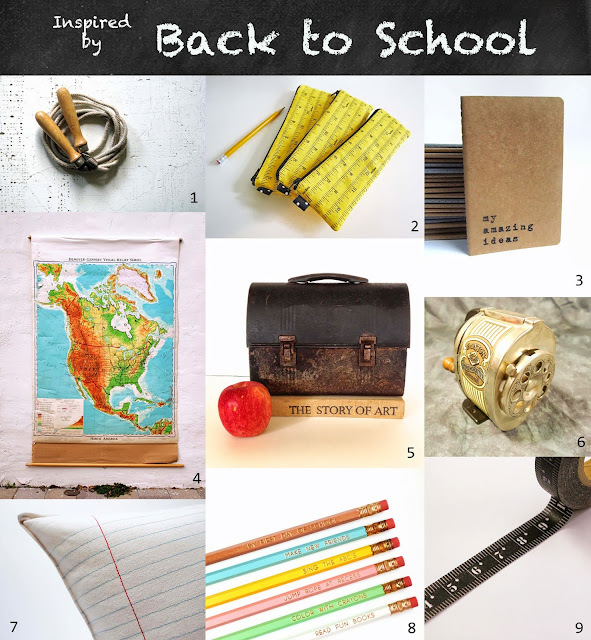 So I'm all inspired by back to school, and yet, my kids are still on summer vacation! While our family loves the unscheduled bliss of summer, It. Is. Time. It is going to be a busy Fall for us, but sometimes a schedule is good for the soul... not to mention my sanity. Just one more week to go!